My Reports (PDF Reports) makes it easy to build PDF reports from scratch. You'll be able to communicate the results of a website audit, present a competitive analysis, or show progress after a marketing campaign. 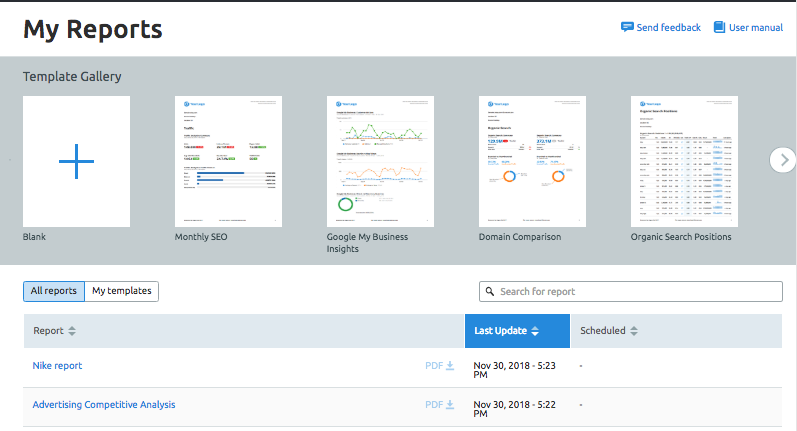 Integrate modules from dozens of SEMrush tools, Google Analytics, Google Search Console, Google My Business and any screenshots and images of your own to make the perfect reports for your business. The My Reports section can be found at the bottom of the navigation menu next to the other Management tools. When you first open My Reports you'll see your Report List with all the PDFs your account has exported. If you’ve made PDF exports in the past and misplaced them on your computer, you can find them here and download again. This list includes PDFs exported from analytics reports, Project tools, custom reports, and your scheduled reports. Whenever you export a PDF of data from SEMrush, we’ll save it in your Report List for your reference. If your account has a high number of reports, you can search for a specific report with the field at the top of the page. Each report in the list can easily be reopened, downloaded again, edited, copied, or deleted using the settings gear. When making a new report you can choose to start from scratch (1), from a pre-existing template (2) or from your own custom template (3). Each template includes a set of specific reports based on some of SEMrush’s most popular tools. We have templates for a Monthly SEO Report, Domain Comparison, full Site Audit report, and more. If you think there is a certain template that SEMrush does not currently have available, you can suggest one to SEMrush. To use a template, select the one you wish to work with from the menu and enter the domain and database that you are reporting on. After you enter that info, SEMrush will populate the template with data from your domain and database. Then you can continue to customize your report in the Report Builder as if you were making it from scratch. To create your own custom template for client reporting, click on the gear icon and select the create template option from the drop-down menu. Once you create your own custom template, you will find it in my template tab of My Reports. 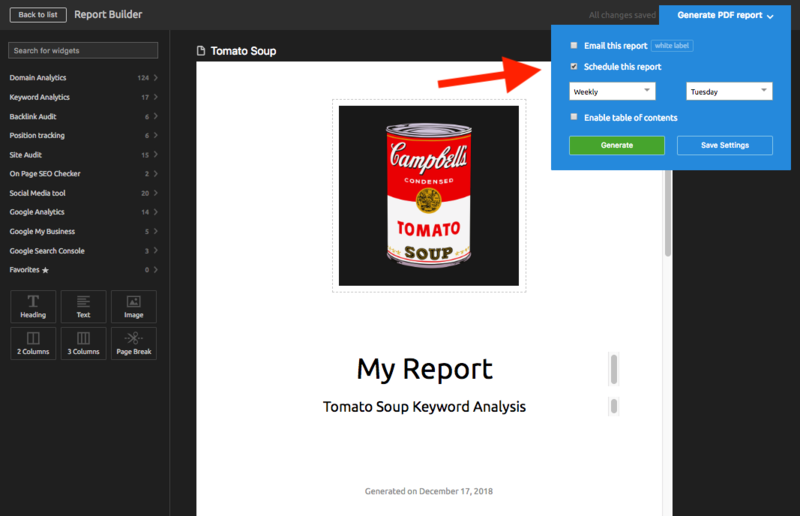 To create a new report from scratch, navigate to the green button located in the top right labeled “+ create report.” This opens the Report Builder where you can populate your report with modules of SEMrush data and custom images. 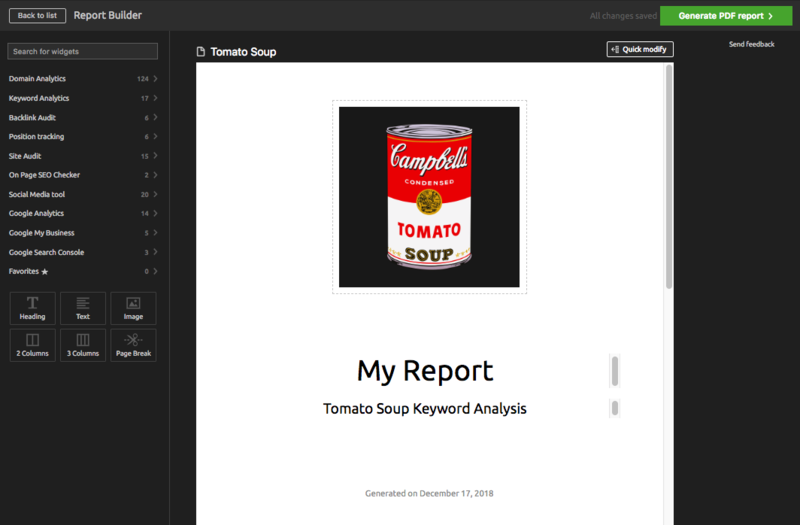 Add a report title, subtitle, and even your own logo on the cover page of your report. If you have a GURU or BUSINESS level account, you’re able to brand reports by placing your logo on the cover. With a BUSINESS level account, you’re able to go one step further and white label your reports, meaning you can add a company logo and remove the SEMrush logo from the headers and footers. To customize the content of your report, drag and drop elements from the left menu panel into the Report Builder. There are structural elements such as columns, text elements, titles, and page breaks in addition to data widgets to organize the shape of your report. You can see a preview of what the widget will look like within your report by hovering over the info icon located to the right of every widget. As you drop the widget into your report, you can set the parameters such as keyword, domain, database, time frame, etc. based on what data the widget pulls from SEMrush. Are there certain widgets that you use more than others? The favorites tab will save your go-to widgets so making new reports from your favorite reports or tools is easy. To mark a certain widget as a favorite, simply click the star icon directly to the right of each widget. Just like inserting a custom logo onto the cover of your custom report, you can also add images to the body of your report. To enter an image into your report just drag the image widget from the toolbar on the left to your report. Once the widget is dragged over you can select any image from your computer to upload to the report. This is perfect when creating more in depth reports if you want to include a screenshot from another analytics tool you use. Or, include an image of a client’s product next to data about its performance to make a more visually appealing report. 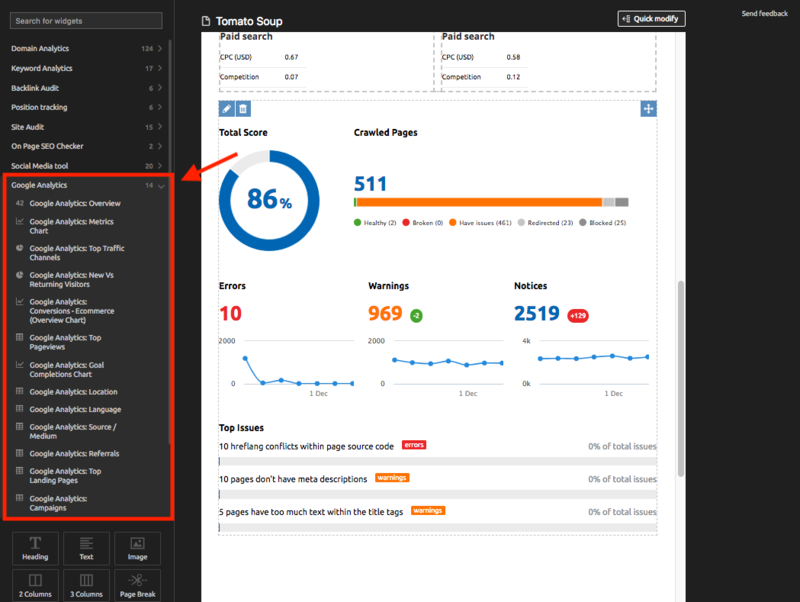 The Site Audit widget lets you access the data for your overview, issues report, crawled pages report, detailed issues, incoming internal links, canonicalization, and more. The Position Tracking widgets can show the visibility trend, keyword rankings table, and rankings distribution. The Social Media Tracker widgets can add data about your competitors’ posts, audience, activity, and engagement across Facebook, Twitter, Pinterest, Instagram and YouTube. The On Page SEO Checker widgets let you add the list of ideas that SEMrush generated for your site, as well as a chart of the trend of recommended ideas. The Backlink Audit widgets let you include your audit's summary, bar graph distribution of the website's referring domains by toxic score (% of referring domains that are toxic, potentially toxic, and non-toxic), anchor types, top anchors, and the ratio of follow vs nofollow links. Maybe you created a perfect report for one client and want to reuse that style for a different client. This is where you would use the “Quick Modify” and “Quick Clone & Modify” features. The Quick Modify feature located at the top right of your report will allow you to quickly and easily change the domain and name of the report thus ensuring that the data is from the same tools just a different domain. The Quick Clone & Modify feature is located in the My Reports report list. 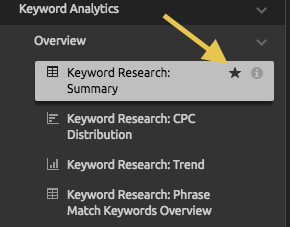 If you hit the settings gear and scroll down to "Quick Clone & Modify," you can copy a report from your list and jump right into modifying it with different domain or keyword data. You can now pull widgets directly from Google Analytics and Search Console into a custom report. The Google Analytics widgets are located at the bottom of the left menu. Just like any other widget, simply drag and drop into your report. 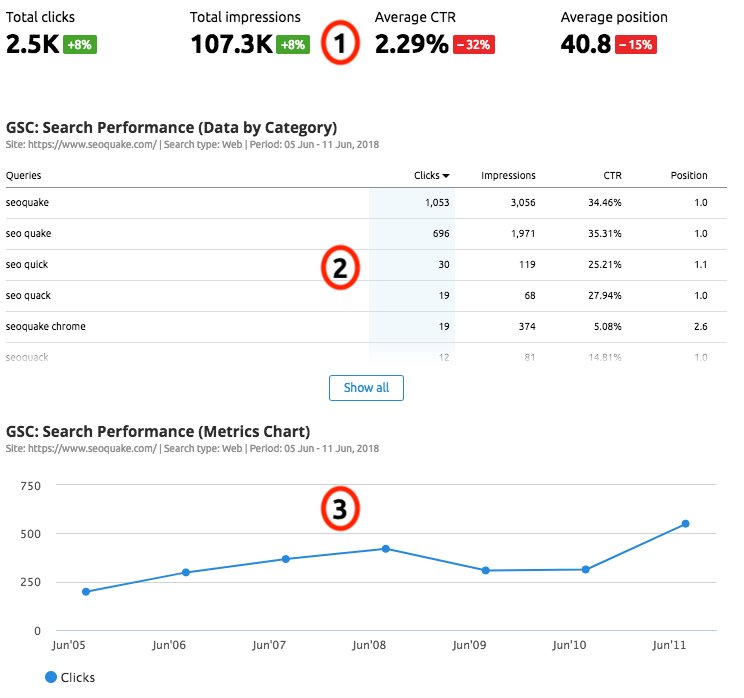 For more on all of the ways you can integrate Google Analytics and Search Console into SEMrush, read this article. 1. An overview of actions that your site received from the set time period: website visits, requests for directions, calls and photo views. ... and what time of the day your business receives the most phone calls. 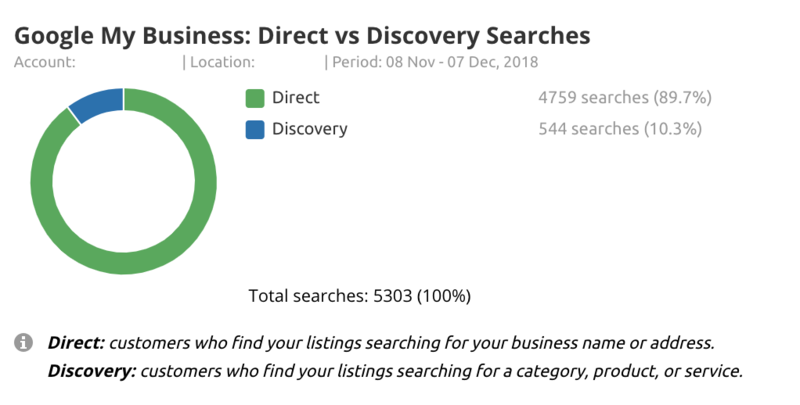 These widgets from Google My Business are an excellent way to show a local business client how their online visibility directly impacts customers finding their information online and interacting with them. Combine them with data from Google Analytics and Search Console to present a total bird's eye view of a website's visibility on Google. Finally, you can automate reports through scheduled emails. The settings allow you to set the specific email you want reports sent to, as well as the day and frequency in which they are being sent. Reports can be sent out on any day of the week and set to a daily, weekly or monthly schedule. Here you can also enable a table of contents to make for easy navigation of your custom report. Are you ready to make your own custom reports? Try it out now at SEMrush.com/My_Reports!